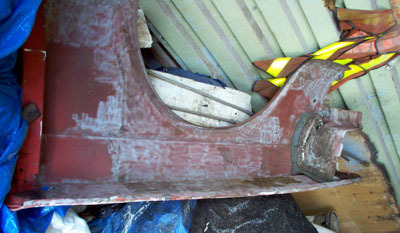 Mustang fender restoration and repair continues, with surface rust removal and old under coat removal. Even with a pretty solid car like my 1965 coupe, there is still work to do on the Mustang fender to get it ready for the road. Although there are no serious issues with the fender, I've taken my small sand blaster or media blaster and started to knock off any surface rust. 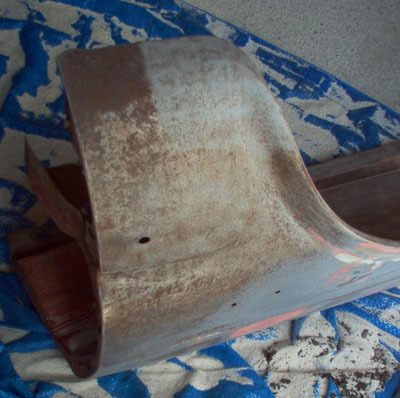 The areas to pay particular attention on the Mustang fender restoration, was at the bottom or near ground areas as well as the inner body styling creases, which had more surface rust. 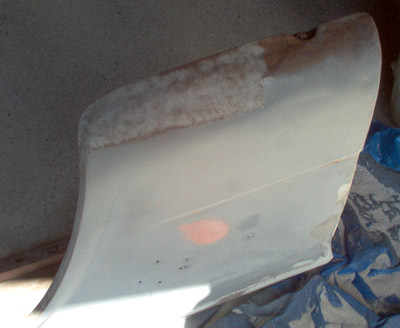 Then it was time to attack the old undercoating over spray, located on the underside of the top of the fender. Although the original material may have been tar based or something similar, what remains is hard and crusty. While it was tempting to keep it there, since it had done such a great job protecting the metal all those years, I wanted to make sure that no rust had worked it's way underneath and started breaking down the metal. The undercoating was hard and fairly brittle, so it took only a little work with a large screwdriver to pop most of it off. 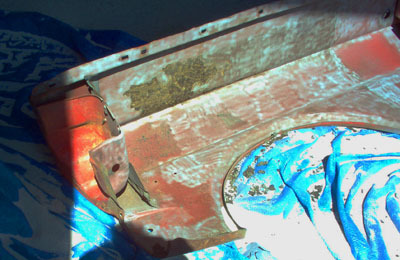 Then using the mini sand blaster, I went over the area and stripped it down to the original paint and metal. It was also a great opportunity to flip the fender over to the outside and get at the surface rust that was on the front and back lower parts of the fender. It's pretty easy to see how a few minutes work can guarantee a good rust free surface. Once all the media blasting or sandblasting is done, I'll hit the entire area with my orbital sander and further clean up the surface and old paint. I want to give the entire surface some "tooth" or roughening so that my epoxy rust preventative and sealer can take a good hold and adhere properly to the freshly cleaned up metal. Before I continue I'll treat the entire surface to some Oxalic acid or Naval Jelly, to remove the last little bits of surface rust. In my case, this falls into the category of a re-do, because I had previously stripped these areas down to nice shiny metal, but because of a couple of months in the winter, that the car spent, sitting in a wet shop, the humidity caused surface rust all over! Just like the Mustang inner fender and frame rails, the entire area will be returned back to bare metal in preparation for the sealer. For a factory look I could have painted the inner fender body color. But since I'm more interested in a Mustang fender restoration that will be good for everyday driving and rust protection, I decided to seal and undercoat the entire inner fender and wheel well. If your aim is a Concours exact from the factory look and finish, you'll want to go with the original factory paint scheme, which means no rust protection and body color paint covering all of the inner fender area. 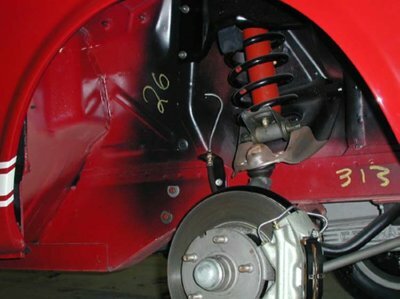 The one exception is the black paint on the top cover you see bolted over the coil spring and the factory shock area overspray. Looking for something? Use the search box to find information fast.